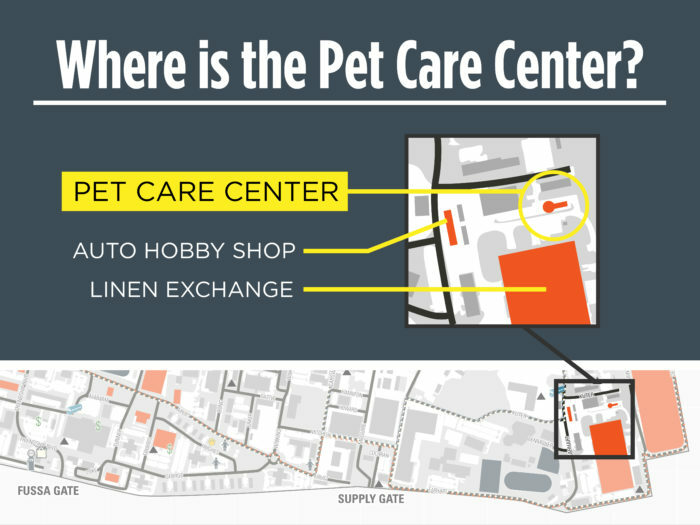 The Pet Care Center offers pet boarding for dogs and cats. We know your pet is a member of your family, so we treat him like a member of ours. Personnel PCSing IN, TDY, on emergency leave or vacation, can board their pets for up to 30 days. There are 24 dog kennels and 12 cat kennels. Prices listed are per day. If you reserve a Pet TLF room, please do not reserve one for Pet Boarding. Vacation Pet Boarding reservations are available for current and next month. Example: It is May 4. You can reserve up to June 30. Restrictions apply. Dogs can only be boarded with Dogs. Cats can only be boarded with Cats. Combined weight cannot exceed 100 lbs.